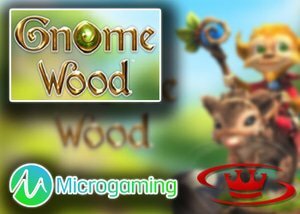 Reputable software provider RabCat in collaboration with Microgaming is about to release their latest online machine titled Gnome Wood slot. This brand new enchanting slot is to be rolled out at the end of August across all Quickfire and Microgaming platforms. New Gnome Wood slot will be available on desktop, tablet, as well as most other mobile devices for as little as 0.25 to 50 per spin, depending on the currency played. Anticipate an experience of al lifetime with the new slot Gnome Wood featuring with 5 reels and 3 rows. Powered by Microgaming and RabCat, venture into a fantasy world and encounter a magical forest full of unusual, small creatures. The game follows the adventures of a tiny gnome who lives in a cosy hidden hole beneath a mushroom covered hill. Visually, the slot draws you in with some of the most impressive graphics you will likely see in a slot - and then draw you in further with a fantastic feature set which includes wandering wilds, bonus features, free spins while offering instant play, mobile play, autoplay and more. The high-value symbols on the reels all relate to the slot's them and includes: a lantern, a flower, a book of spells, a cauldron and 2 creatures. The four low-value symbols are depicted by a number of small stone engravings. Furthermore, the scatter is represented by a golden shield with a creature engraved on top. Finally, the wild symbol is depicted by a stone tablet with the word "wild" on top. The wild symbol can substitute for all other symbols apart from the scatter. New Gnome Wood Slot features with 2 majestic free attributes that will reward you with lucrative winning opportunities. Be on the lookout for the Wandering Wild Feature that will add more re-spins to your total as well as a Free Spins Feature that will reward players up to 10 free spins that can be re-triggered. Gnome Wood is a medium low volatility slot machine with an RTP of 96.63%. This is a really simple online slot, with two interesting features. Moreover, the graphics are nice and so is the soundtrack, as well as the animations. This is a great wagering game, which will help you make a cashout thanks to its plentiful small wins. Start creating your own magical forest of good fortune by looking for the new Gnome Wood slot at all Microgaming provider channels. Enjoy a Microgaming No Deposit Bonus when playing this fabulous slot. Free Spins bonuses are the best way to try a new casino, on this site we give tips over new casinos all new latest signup free spins bonuses, as well as Casino reviews with the latest deposit and no deposit bonus offers for desktop and mobile players. As an online betting review site, we recommend you visit Roxy Palace Casino the number one choice for real money Canadian punters. You can start by trying the games, courtesy of a no deposit offer amounting to 10 GBP (British Pounds). No voucher or coupon code is required. If you like what you see, and then you can sign up. The establishment offers a decent welcome package to all new punters that consist of 100% match bonus up $350 on your first deposit. Be sure to keep an eye on the promotions page of the website so you don't miss out.